Vickie Lee DePaoli Andreason, 64, of Sparks, Nevada passed away peacefully at her home on January 19, 2019 after a short and difficult battle with Cancer. Born February 14, 1954, to parents James and Marilyn DePaoli, Vickie was born and raised in the Reno-Sparks area. Vickie was a devoted wife, mother and grandmother, who loved spending time with her family and friends. She enjoyed camping, gardening and crocheting and said the best decision she ever made was to choose to care for her grandchildren the past 23 years. 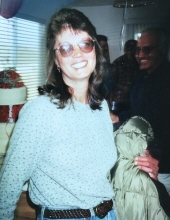 Vickie was preceded in death by her father, James DePaoli, step father Jerry Campbell, son Wayne Andreason; best friend and sister Sandy Bennett and loving brother Gary DePaoli. Vickie leaves behind her mother Marilyn Campbell, devoted husband of 48 years, Dee Andreason; and loving sons Dan (Jennifer), Brent (Tiffany) and Mike Andreason; brother and sister in law, James and Remy DePaoli; as well as 9 grandchildren, Nathan, Joey, Justin, Jaret, Ellie, Alexa, Cobi, Shawn and Jessica; and many loving nieces, nephews, cousins and close friends. All friends and family are invited to celebrate her life on Friday, February 1st at 2:00 pm. The service will be held at Mountain View Mortuary, 425 Stoker Avenue, Reno, Nevada 89503. Vickie requested a “party with friends, family and laughter, to remember the happy times”. All family and friends are invited immediately following the service, for a gathering at her home at 3315 Montecito Dr, Sparks, Nv 89431. To send flowers or a remembrance gift to the family of Vickie Lee Andreason, please visit our Tribute Store. "Email Address" would like to share the life celebration of Vickie Lee Andreason. Click on the "link" to go to share a favorite memory or leave a condolence message for the family.